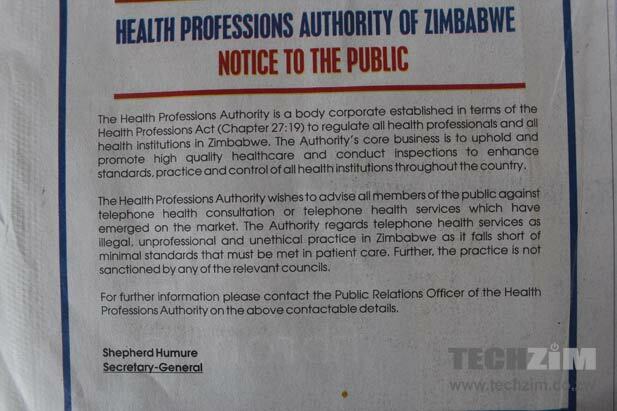 A week ago the Health Professions Authority of Zimbabwe (HPAZ) was reportedly concerned about the legal status of the Econet Dial a Doc service which the Authority felt had been launched illegally. Now, HPAZ has taken the issue one step further by issuing a notice in the media advising the public against telephone health consultation and telephone health services that are on the market right now. When we last mentioned HPAZ’s reservations about Dial a Doc we weren’t sure about how the Authority would act, seeing that Econet had sought and received approval from the Ministry of Health for it the other Econet Health services like the SMS-based health tips. HPAZ hasn’t responded to our questions about this conflict between its concerns and the Ministry’s approval of something that the Authority regards as illegal, unprofessional and unethical. However this notice to the public seems to suggest an official denouncement of Econet Dial a Doc, but at the same time it doesn’t call for its withdrawal from the market. So is HPAZ that concerned about the quality of medical service we get in Zimbabwe or this is just some sort of fight against a new type of consultation that could disrupt the age-old business model of physical visits to the doctor? New is actually relative when you consider that dial a doctor services have been launched in other countries around the world and Econet is just adapting this service to the Zimbabwean market. This is actually the first sort of tech medicine that the world will be seeing, something that was even acknowledged by The Ministry of ICT in the deliberations over the new ICT Policy. Perhaps HPAZ is waiting for an over-the-phone misdiagnosis to initiate more concrete action against Econet or any other mobile network and service provider that wants to experiment with tech to deliver health services? Econet has refused to say anything new in response to the HPAZ public notice and has stood by what it has said earlier. We will share whatever communication is made by the Ministry of Health or HPAZ regarding this matter, but for now Dial a Doc is active so you can go ahead and dial 147 if you want a medical opinion. Voice platform will never be enough to provide adequate diagnosis for medical conditions – basics like temperature, blood pressure, ear/throat/eye scrutiny are sadly missing, but provide the most useful clues for ailments afflicting the infirm. This is another case of Econet bulldozing its way to provide a “me-first” half-baked value-add service to try and bleed a little more moola out of its drastically reduced voice/sms revenues. At the end of the day the dial a doc service will evolve into a platform for the infirm to get fleeced of their hard-earned cash just before they get told to go and see a real doctor for “further tests” – who does that? Hahaha, too many emotions and little fact in your comment. How is this product “half backed”? You say Econet bulldozed their way into the market with this product, well read the article again, they got approval from Ministry of Health. Matter of fact, Ministry of Health officials were at the launch. What we have here is a case of government agencies not in sync. Ministry of Health and HPAZ should have collaborated in approving this service. Another thing, if you check the terms and conditions of the service, they clearly say this is no replacement for a doctor. We can criticize Econet for a whole lot of things, but I don’t think you have facts here. This service is not a good thing as it appears, in the western world they are battling what has become known as cyberchondria and this is not so different from diall a doc. you can never substitute physical diagnosis in the medical field. Cyberchondria comes about when patient searches about symptoms on the internet which they can do in anyway. In this case Dial a Doc will reduce that because the patient in place of google is speaking to a real doctor not just information done posted on the internet by an unknown person. Technology is here and here to stay, many nations have embraced it. In Malawi there is Chipatala Cha Pa Foni, Hello a Doctor in South Africa, Daktari 1525 in Kenya, the list goes, there is nothing new here. – Most patients struggle to articulate their medical challenges, and the presence of a Dr is necessary in helping figure out a patient’s problem by looking at physical cues, etc. For example,dry lips and dry throat could be a symptom of diabetes, which cannot be figured out on the phone. – Diagnosis in Africa when you visit a Dr, is largly knowledge-driven guesswork. You tell you Dr what you feel, then they they observe and prescribe a solution based on what they learnt in medical school and from experience. If it doesn’t work, you go back to the Dr and s/he tries again. This is unlike in first world countries where a patient is subjected to a battery of tests to identify the exact problem – precise diagnosis. This form of diagnosis is complicated by is worsened by asking a patient who is a layman on the phone, especially if the questions are done by a junior Dr.
– Telemedicine presents ethical challenges in medical practice – telephone diagnosis borders on “quackery”. It creates serious challenges to medical ethics – which are not far from patients that Google health problems. It can also cause problems if there is a misdiagnosis if a patient takes medicine to fix a wrong problem. We are in the information age and dail-a-doc is simply an information platform which is not replacing traditional doctors. 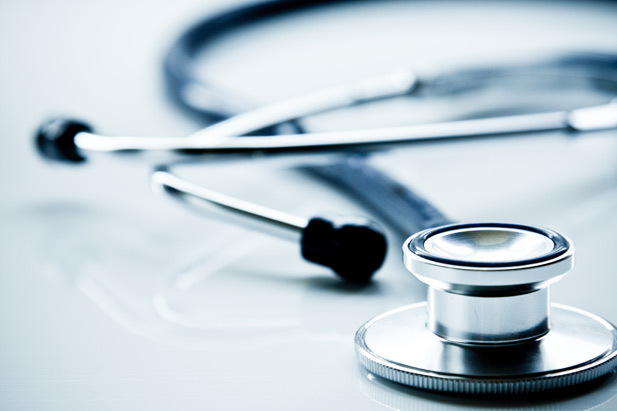 – This is technology that can be adopted by healthcare professionals to enhance their services. The advantages are endless, information simply gives power to the consumer . Yes, power to make good and wrong choices but the most important thing is that the choice is the consumers. Thanks for your article. Its very informative and good.